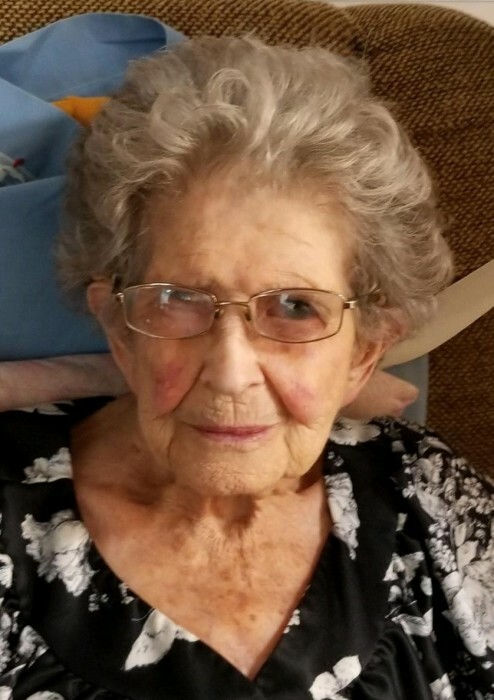 Virginia Andrews, 95, of Carlos, IN passed away Friday, March 15, 2019 at Hickory Creek Residential at New Castle, IN. She was born June 1, 1923 in Randolph County, IN the daughter of Ralph E. and Clara M. (Clark) Bales. Virginia was a homemaker, helping with the family farm all her life. She had also worked at Swindell Grocery and Rosebud Creamery, both of Carlos, IN. She leaves to cherish her memory two sons, Mike Andrews (companion, Irma Blackburn) of New Paris, OH and Jim Andrews (wife, Marsha) of Modoc, IN; a daughter, Susie Farmer (husband, Tom) of Lynn, IN; twelve grandchildren; 27 great grandchildren (with one on the way); and five great-great grandchildren (with one on the way). She was preceded in death by her parents; a loving husband, Glen; a daughter, Linda Isenbarger (and her husband, Russell); a sister, Betty Joan; and two brothers, Billy Dean and Wallace Reed Bales. A service to celebrate Virginia’s life will be 1:00 p.m. Wednesday, March 20, 2019 at Union Chapel Church of Carlos, IN with her nephew, Pastor Dave Bales officiating. Burial will follow in Union Cemetery of Carlos, IN. Family and friends may gather to share and remember from 11:00 a.m. to service time on Wednesday, March 20th, at the church. Memorial contributions may be made to the church at Union Chapel Church, 3909 W. 950 S. Lynn, IN 47355. Wilson Shook Funeral Home, Thomas Memorial chapel of Lynn, IN has been entrusted with arrangements. Online condolences may be expressed at www.wilsonshookfuneralhomes.com.